After a long day of geocaching while you are swapping stories about the grand adventures, the last thing you need is a warm beverage. We are here to help. 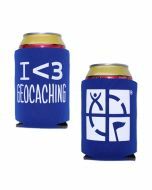 Coozy up that beverage and show your geocaching pride with a Geocaching Coozy! 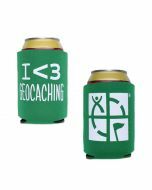 These are made of foam and feature the official Geocaching logo on one side, and the classic phrase I <3 Geocaching on the other. Fits most standard geocaching cans and bottles and folds flat for those of you needing to keep things cool on the go.